I’ve been through the MeshCam manual here… http://www.grzsoftware.com/manual/ and still don’t understand what some of the toolpath settings mean. Are there any good overviews that go over the MeshCam features and settings in more detail than the manual? 1 How to control spindle speed? 2 When is it best to use parallel path and when should conventional or climb milling be used? 3 What does “enable arc fitting” do? 4 Waterline and Pencil are ambiguous terms. I get some idea about how they work from seeing the simulation but are there any good tutorials on how to use these settings most effectively? Also, if you bought a Nomad then you have the ability to make lithopanes from black and white picture images. You don’t find anything in the menus that indicate this. You find out only if you are curious and decide to try to load a .bmp or other picture file format. This is an awesome feature and it should have a dedicated GUI button, IMO. There is always room for better documentation! There are no overrides. The RPM is set in the tools database. I don’t like this either. I wouldn’t mind if the tools database value was entered, but show it to me and let me change it. This is more advanced knowledge of machining. It depends a great deal on what you’re doing and stock. Climb milling is often the correct answer (despite the “conventional”). Look at the pictures and shapes and I think your questions will be answered; we can help with what’s left. Depending on the shape one is milling, one chooses to obtain the nicest finish and tightest cutting (since these are approximations). If MeshCAM can find a circle, it will use G02/G03 - the CNC machine does the circle as one or two arc commands. Otherwise, MeshCAM emits a great many G01 (linear cut) commands to approximate the circle. If it can use it, the G code file is much smaller (if there a lot of circles). These are the traditional names for the techniques. Waterline comes from what the side looks like when you’re done - think of an evaporating reservoir. Pencil is drawing around the object with a pencil… just like how one would make an outline on a piece of paper. Pencil is used to clean up edges that were waterlined (which is necessary since the bite of the end mill cannot go all the way through a stock). One pass around using the full length of the flutes reduces or removes all signs of the waterline. Lithophanes are done in MeshCAM via a technique, not a specific button. Have you visited the MeshCAM site and seen how they describe all of the features? Many of us have gone with CandleStone rather than Corian as the results are nicer. YMMV. 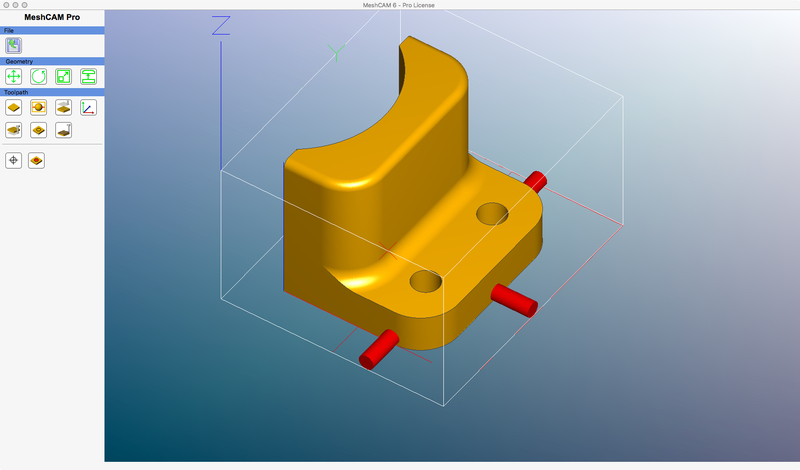 -MeshCam is for the most part very easy to use with the Nomad, especially using the Carbide3D toolpath settings. -MeshCam is the reason I was willing to take the CNC plunge. It makes the kind of milling I want to do very easy. -Robert at MeshCam has been great about answering my questions whenever I email. -I love the ease of use… at least after I received the Mark Bellon crash course over the phone. We are all overloaded with trying to learn 50 different things. When I have to watch 10 videos and visit 5 different web pages to put it all together its too much and I lose motivation.IMO, the manual should be in the help section of the program and all of the buttons/settings should be explained there. Links to the videos could be included in hover dialog boxes that they relate to. The videos are great, by the way. Its just difficult to keep track of where to find everything. I think a very quick 3d motion rendering showing each of the X, Y, XY, waterline and pencil in motion and a simple icon giving a reference to “surface angle limit” and “minimum surface angle” intuitive would be easy to add and would be very helpful. Thanks for the links. I wanted to post this since I’m sure others are wondering many of the same things. If I ever develop a software app or program I will spend a lot of time video’ing first time users to understand where the “green” mind gets stuck then adapt the program to lower the speed bumps. Again, MeshCam is pretty awesome, especially for the price. I’m glad this forum is available to clear up some of the more detailed questions. I’ll go through the links you posted. That would be a great thing! Why do most tutorials say to turn arc fitting off? It seems like it would be better to use it. Any links regarding the best way to use (and not use) paralell, waterline and pencil finishing? The only thing I can suggest is that some machines don’t support G02/G03 (even though according the standard they must) and turning it off prevents problem reports. The Nomad is listed as supporting them. If there is a large number of arc/circles involved in a job it makes a huge difference in the size of the G code file - but nothing in the finished product. Bresenham is Bresenham - wherever the work is done. How to best use the machining methods in MeshCAM isn’t something I can write up quickly. To a large extent it depends on the geometry of the 3D shape being machined. @Randy pointed out that I was using good parameters at one point and showed me a nice set of values that improved things nicely. I’ll share it here - it can be used as a “magic formula” until I can write up and explain the details. Use a surface angle limit of 47 degrees for parallel finish; a minimum surface angle of 43 degrees for waterline finish. With a ball end mill this works out pretty close to the best one can possibly do in MeshCAM. It’s all about trying to keep the scallops and tool marks are fine as possible. Can you show a sketch to illustrate where the angles are referenced from? I guess you want waterline to handle the vertical walls since that’s more efficient. I’m sure once I can visualize the reasoning it will seem more obvious. Yes, it’s all about the angle of departure from the vertical of the surface being machined. I think this does an excellent job explaining things. The 47/43 degree setting should now make sense. The default values are pretty good; @Randy does it better. Exactly what I was looking for! Thanks, Mark. It’s a bummer that scallop cutting only comes in expensive CAM packages. Constant scallop is what I was picturing in my mind and that’s why the angle settings didn’t register at first. It’s a bummer that scallop cutting only comes in expensive CAM packages. Constant scallop is what I was picturing in my mind and that’s why the angle settings didn’t register at first. Once one gets into adaptive or hybrid CAM strategies the time to develop and maintain the strategy goes through the roof… and the complexity grows nearly exponentially as one adds more axes (4 and 5). High end packages have as many as 20 strategies that work with 3, 4, and 5 axes. The math and maintenance issues are quite a challenge. The package I own and use for complex jobs - BobCAD-CAM Mill Pro MultiAxis (V28 currently) - has the hybrid and adaptive CAD strategies and 4th and 5th axis support. The purchase and support price are… formidable. I get the results I need, the bugs fixed quickly, and I don’t have to learn 20 strategies and ~400 parameters again. Expensive, but I’ve been using it for years. I have a post processor for BobCAD-CAM for the Nomad. I haven’t used it much since I’ve been doing things I share with the Forum and I’m willing to be bet I may be the only one using BobCAD-CAM. When it is on sale (like right now) it’s an awesome CAD/CAM package with impressive support. I’ve got some ideas for a project or two and I will be using BobCAD-CAM since I MeshCAM would require multiple invocations and other tricks (@Randy is an expert at that. Me, I let the CAM software to the work. YMMV). Other “high end” packages can cost tens of thousands of dollar US. They are this expensive because a huge volume of parts runs is generated with them… and they have to work. Machine usage costs, no mistakes, increased speed and minimized tool wear all come into play. Could all of this be open source? Sure! The work would be enormous. Since the needs are exotic there just isn’t sufficient critical mass to do it… and most machining is 3 axis (or multi axis indexed) -excellent quality parts can be created without all of the fancy strategies… especially in the hobby and prosumer marker where time and machine usage costs don’t really come into play. 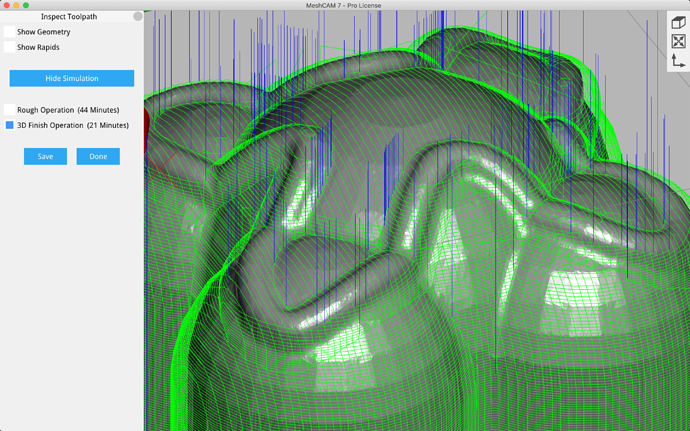 Remember to set the MeshCAM tolerance to 0.0001" and let it crunch. The more CAM computation up front, the better the tool path will be. That said, you really should look at Fusion 360 for 3 axis work (and 4 and 5 axis indexed; Pro version). It offers many of the fancy CAM strategies at a fair price (per month; cheaper when purchased by the year). Many in the Forums are using it instead of MeshCAM since it has really good CAD abilities and excellent CAM support. I’m hoping that Fusion 360 will eventually have 4 and 5 axis continuous machining support. There is just too much to relearn and remain effective until I’ve got all of the features I’m used to. If the cost is low enough, the pain of relearning (CAD think, CAM think) would be worth it. Keep an eye out for this problem. There is no known workaround as yet. We’re waiting to hear from Robert on an ETA for the fix. I’ve had the Meshcam gouging issue when machining an emblem on a spherical surface. That sounds, very much, like the kind of surface that cause the problem to surface. Could you please post the STL and a picture of the settings? More data will help with the debugging. Please add the data to the gouging entry, not here. For anyone landing here in 2019, MeshCAM version 7 now generates a roughing and a finishing pass. The finishing pass appears to be the scallop cutting that is mentioned here. Here is a screenshot of one of the included samples.